Please submit this Contact form and a member of our staff will respond and assist you within 24 hours. The Research Center operated by Delta Member Services Inc., provides private club member access to ground breaking research, technologies and other resources intended to address issues of bioelectric depletion through the use of general health (non-pathology specific) self enhancement protocols, while also determining whether member is in good standing with membership in the Delta Institute International Research Club. A research prospect is required to be an active member of the private club, in order to gain access to the private club value-added benefits, proprietary technologies and other sought-after resources available only by and through the independently operated Delta Research Centers, and if accepted for the research program, the member will be required to abide by the commissioning construction for private use of technologies for self enhancement protocols, and the terms and conditions of the private club membership agreement, including but not limited to the Research Center Addendum, Release Form and Affidavit. The following documents are the example origination documents that are required from active private club members, in order to purchase and meet the criteria to participate in the value-added Research Center Program. and provide for the release of liabilities. limited to the membership agreement. products and services may apply. is intended to cover services provided both before and after the date of this Agreement. provisions herein shall remain in full force and effect. By: DELTA MEMBER SERVICES, INC.
That Delta Member Services, Inc.
have not been evaluated by the Food and Drug Administration. scientific by the FDA, nor are they recognized. recognized by the FDA, or other applicable agencies of government. intended to be interpreted as medical advice. never intended to diagnose, treat, cure, or prevent any disease. diagnostic, or for any prescriptive use. Formulary, or the United States Pharmacopoeia, or any supplement to them. energy fields of man or other animals. cellular function may present as an unintended collateral effect. CORRECT TO THE BEST OF KNOWLEDGE, AND BELIEF. nts in the BX Protocol. your raw data and case study. identifiable to you so that credibility may be added to the research presented. The statements contained on these pages have not been evaluated by the Food and Drug Administration. Many of the modalities utilized at Delta Member Services, INC., (DMSI) are NOT considered scientific by the FDA, nor are they recognized. The modalities offered through Delta Member Services LLC are for private club members only and should not in any way be used as a substitute for approved medical treatments recognized by the FDA, or other applicable agencies of government. Services provided through DMSI are not intended to be interpreted as medical advice. Always consult with your government authorized and licensed physician before deciding to participate in the various programs offered through DMSI. Education and general information offered through DMSI is never intended to diagnose, treat, cure, or prevent any disease. DMSI private club members are encouraged to consult their health care provider before beginning any cleanse, diet, detoxification program, bio-electric modalities, homeopathic energy catalysts, or any supplement regimen. The information on this site is not to be used to replace the services or instructions of a physician or qualified health care practitioner. Any statements about complementary medicine, foods, diet, disease, treatments, nutritional supplements, homeopathy, colon cleanse, water, energy, bio-electric depletion, general toxicity, and others topics are for educational purposes only. We do not prescribe, diagnose, or make medical claims. Intended to affect the structure or any function of the body of man or other animals, and achieves its primary intended purposes through non chemical action upon an underlying Sub-Quantum Esoteric Field, (SQEF), residing within the energy fields of man or other animals. Dependent upon being metabolized for the achievement of any of its primary intended purposes, though increased efficiency in metabolism or cellular function may present as an unintended collateral effect. Again, private club members should gain a full understanding that every aspect of DMSI’s services are intended to effect nothing beyond the Sub-Quantum Esoteric Field, (SQEF). This field is represented as a quasi-quantum entanglement of energy and should not be interpreted as having any relationship to particles, atoms, molecules, matter, motion, time, energy, or force, including but not limited to the composition, structure, or properties of any such measurable scientific construct. The SQEF can only be understood as a non-corporeal, immaterial metaphysical substance. It could be further defined as a ubiquitous, non-quantifiable substance or energy. To the best of our knowledge, the SQEF is not currently regulated by the FDA or other governmental agencies. However, there are many indications that the Department of Peace, a newly proposed cabinet-level department of the executive branch of the U.S. government, may determine in the near future those pervasive energy realms such as the SQEF should in fact be regulated by government. Only time will tell. Oxide Saturated water to reduce antioxidant values which then allow the BX to form more hydroperoxides that clean out the mitochondria. Far, near and mid frequency infrared sauna is a full spectrum infrared that heats the tissues from shallow to deep levels in the body to enhance the availability of oxygen in the tissues by way of increased blood perfusion. The oxygen combines with the electrons released by the BX to form hydroperoxides that clean out the mitochondria. A piece of equipment designed to create a field of energy that helps to enhance electron availability within the mitochondria. Remember: increased electrons+02=more peroxides=clean and efficient mitochondrial function. Generates a field in which electrons are excited to the point that chemical reactions in cells are improved and enhanced. A full spectrum wave length radio oscillator similar to the original equipment used in the 30’s and 40’s. Solid state oscillator not as effective as analog yet very useful in enhancing cell function. An enclosed chamber that increases air pressure to help force oxygen into tissues and there by enhances BX effectiveness. Generator of photon (light) energy used to increase energy levels in tissues to enhance BX function. Tube based wave production used to locally heat tissues to induce an immune response, increase blood flow, and boost lymph movement. A use of high flow oxygen during exercise designed to increase pulse and blood pressure to force more oxygen enriched blood into all tissues especially tumor tissue to enhance immune function and BX response. These analysis' help us to determine the oxidation potential and the potential of the redox capacity in the system. It gives us a quantifiable result that aids us in determining the progress of therapy. Reactive oxygen metabolites (Free Radicals) Levels of reactive oxygen species which helps us track the BX function. Helps to regulate body’s response to ROMS and helps us to measure BX function. Process of adding a 1% saline solution to blood to determine how much ATP energy is being produced in the cell. In healthy cells, ATP production allows proteins within the cell wall to selectively remove sodium from the cell. Cells that lack ATP cannot meet the energy demands and these proteins lose their integrity, resulting in the retention of sodium by the cell thus preventing the cell from shrinking or crenating. The Cardio Coach by KORR is a piece of testing equipment designed to provide us with information about a member's metabolism. It helps us to determine the ration of anaerobic to aerobic cellular respiration and helps us to quantify it's improvement. Resting energy expenditure calories you burn at rest in 24 hour period. Total energy expenditure. Amount of energy you should consume (calories burned) with exercise in 24 hour period. Change in oxygen during breathing. Change in carbon dioxide during breathing. Resting exchange ratio. Ratio of oxygen to carbon dioxide on exhalation. I guess you need some help. The domain bx4cancer.com is registered via a hiding agent. Registrant Organization: Delta Member Services Inc.
Aside of bx4cancer.com 11 other domains are registered for the same people and reside on the same name servers. netgearz.com is atypical and offers web design. It is claimed to be run by web professionals, but it is a ruin. We offer ready made, fully monetized, functional websites. All of our website comes standard with online forums, SEO optimization, online store & more! No retweets, no likes. All very frugal. Delta Media Works is an Utah Dba filed on November 11, 2013. The company's filing status is listed as Active and its File Number is 8852787-0151. The Registered Agent on file for this company is Linda Pendleton Smith and is located at 5526 W 13400 S #318 Herriman, Herriman, UT 84096. The company's principal address is 5526 W 13400 S #318, Herriman, UT 84096. This company has not listed any contacts yet. Copyright © 2012-2016 · Bizapedia.com · All rights reserved. The Profit Corporation DELTA INTERNATIONAL CLEARING CORP., also known as was registered in 05/16/2012. Filing number of the company 2012-000622420. locates at the address 1621 Central Ave, Cheyenne, 82001, WY, USA. The mailing address of the organization 1621 Central Ave, Cheyenne, 82001, WY, USA. Status of the company Inactive - Administratively Dissolved (Tax). At the company 5 acting official, among which: Dewayne Smith - President, Linda Smith - Secretary, Linda Smith - Treasurer, Dewayne Smith - Director, Linda Smith - Director. DELTA INTERNATIONAL CLEARING CORP. filed 1 documents, last of which Monday, April 22, 2013. There are 5 companies that have an address matching 5526 W 13400 S #318 Herriman, UT 84096. For the names other than Smith I would doubt that they are real. As far as I understand there were problem with the IRS. I do doubt that they are over. May 16, 2012 Delta International Clearing Corp, Wyomingregisteredagent.Com, Inc. The names other than Smith, are they dummies? HERRIMAN - Our Precious Little Girl, Brooke G. Smith, 7, died Aug. 8, 2002 of a pedestrian accident. Born May 2, 1995 in Las Vegas, Nevada, to Dewayne Lee and Linda Pendleton Smith. Brooke was a member of the L.D.S. Primary and attended Herriman Elementary School. Survived by parents, two brothers Calvin Lee and Jordan Pendleton and one sister Bailey Jean all of Herriman; Grandparents Leo and Betty Pendleton of Star Valley, Wyoming; Marilyn Clark of Park City; Marc Broways of Las Vegas, Nevada; and Jack Lee and Linda Smith of Levenworth, Washington. Funeral Services will be held Monday at 1:00 P.M. at the Rose Creek Ward, 5424 W. Rose Crest Rd. Where friends may call from 11:30 A.M. to 1:00 P.M. prior to the services. Interment Herriman Cemetery. Funeral Directors Broomhead Funeral Home. A funeral expense fund has been established at any branch of the Wells Fargo Bank in the name of Brooke G. Smith. So it is Dewayne Lee Smith and Linda Pendleton Smith. and Jack Lee and Linda Smith of Levenworth, Washington. But none of these family members seem to appear visibly in the companies. The whole "Delta (whatever)" and "BX Protocol" business is far from being international. It is nothing but a gangster pair that hides behind fake addresses. What kind of carnival did Dewayne Smith pull of here? Dewayne Lee Smith, Trustee In Trust Of Order Of The Mellenial Day*, And His Successors, A Corporation Sole (*an Unincorporated Altruistic is a Nevada Domestic Non-Profit Corporation Sole filed on August 7, 2003. The company's filing status is listed as Permanently Revoked and its File Number is CS19060-2003. The Registered Agent on file for this company is Eastbiz.Com, Inc. and is located at 5348 Vegas Drive, Las Vegas, NV 89108. The company has 1 principal on record. The principal is Dewayne Lee Smith from Herriman UT. SOURCE: familytreenow.com. Living People Records [online]. Original Data: familytreenow.com. Compiled from 1000's of U.S. Public Records Sources, including property, business, historical and current records. Must be able to design, develop, test, manufacture, install, and repair electrical and electronic equipment such as Tesla driver circuits, and other research in alternative medical equipment. But 5526 W 13400 S #318 Herriman, UT 84096 is no house, no building. No unit. Not even an appartment! 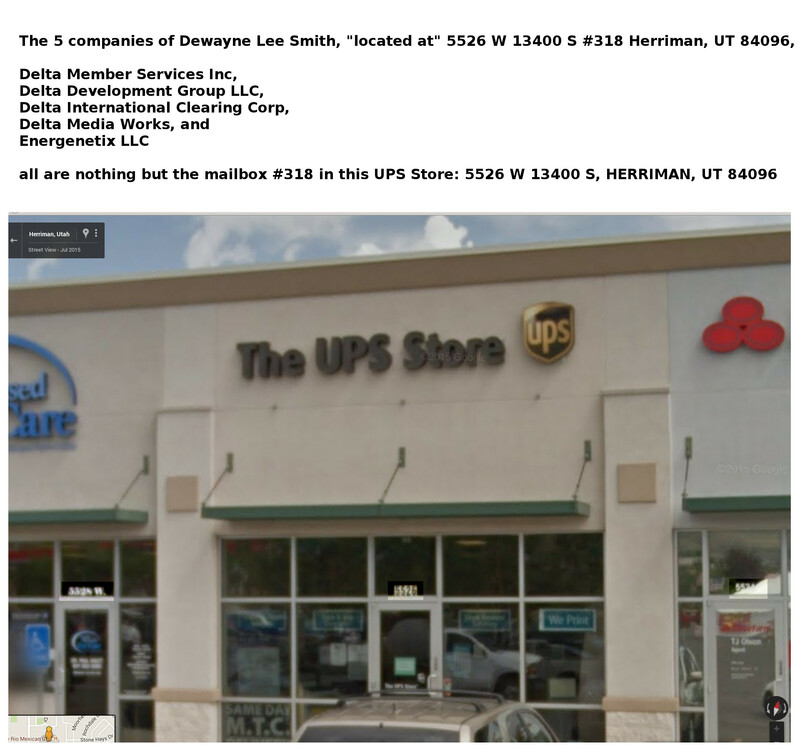 Because 5526 W 13400 S #318 Herriman, UT 84096, is nothing but a tiny metal mailbox in a UPS Store located between some shops behind a parking place. 5526 W 13400 S, HERRIMAN, UT 84096. This is a photo from that shop. Roll to the right to see the arrays of metal mailboxes in the walls. Do note that the UPS Store has the number sign 5526 in the window. The adjacent shops have the numbers 5528 and 5524. 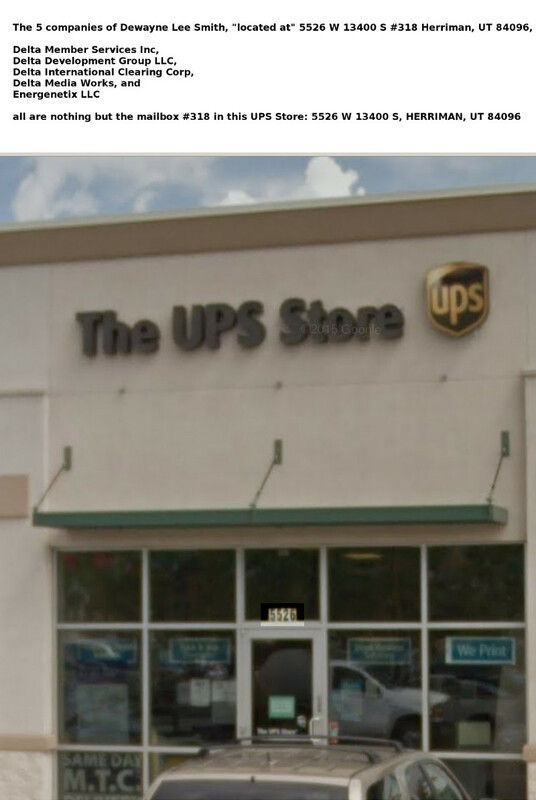 So at 5526 there is nothing but the UPS Store. "Delta Institute" and all the other "organizations" do not exist. They all are fakes and forgeries. There is no real address for any of Dewayne Lee Smith's activities. There is no science behind Smith's stuff. All is mindless babble, and lies, lies, nothing but lies. Even when confronted with pure facts, Dewayne Lee Smiths continues to lie. He is a notorious criminal and gives a damn about the lives of his victims. Smith steals photos and videos. His company addresses are fakes. The wares he sells for exorbitant sums are useless junk from China. His fakes and forgeries and all his other crap are so foul and so dumb that one must ask the question if "Dr." Dewayne Lee Smith ever passed high-school. Which not only shows what a piece of work Dewayne Lee Smith is, but also shines a light on his accomplices and resellers and other partners, who advertise for him, who endorse him, who even use and sell his crap. Smith is not the only criminal in that network. He is one of many.